The TruVision IP Mega-pixel Open Standards box cameras bring state-of-the-art, high-definition pictures to the mass video surveillance market. 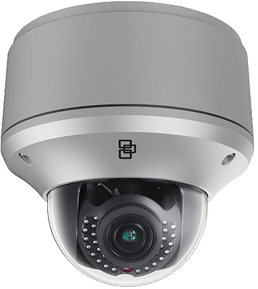 With camera resolutions of 1.3 or 3 mega-pixel, these IP cameras represent a flexible video surveillance device to meet any need. Equipped with advanced technology and signal processing capability, they effectively capture video under challenging conditions. These camera provide an ideal surveillance for environments such as retail, banking, airports or gaming where detailed image capture is critical for effectively monitoring people and transactions. TruVision IP Mega-pixel cameras simplify remote, live monitoring/playback of edge-recorded video. Recording on the micro SD/SDXC memory card provides a level of redundancy in case of unforeseen network disruptions. These cameras also feature alarm inputs and outputs. Privacy masking conceals sensitive scenes and safeguards confidential areas from being observed during live view and recorded on the video file. Special functions are available to assist in providing the best use of your TruVision camera. Included are Hallway View mode to provide a portrait view of a hallway or corridor, De-fog mode to help resolve images though fog or rain and Electronic Image Stabilization for installations subject to vibration.